Weingut Geheimer Rat Dr. v. Bassermann-Jordan GmbH, Deidesheim is a member of Wein‑Plus and thus supports this wine guide. Thank you! By creating Weingut Geheimer Rat Dr. v. Bassermann-Jordan GmbH saved filter, you will see relevant matches on your home screen. The history of the family is inextricably linked to the history of German quality viticulture. The ancestors were outstanding winemakers, art connoisseurs, wine experts and active in political life as mayor, deputies and wine-book writers. Origin is the Ketschauerhof, which was already mentioned in 1250. In 1783, Johann Peter Jordan (whose father had immigrated from Savoy in 1708) built a property and winery in Deidesheim, north of Neustadt an der Weinstrasse, which has remained the focal point to this day. Andreas Jordan (1775-1848) is considered the founder of the winery and also of the quality wine in the palatinate, This bought the Ketschauerhof along with some best locations. From this time a letter has been received, with the JW von Goethe (1749-1832) in 1820 at the winery Bassermann the often praised by him famous, also as comet vintages designated 1811er ordered for a spa stay. Andreas Jordan attached great importance to the planting of only high-quality grape varieties, above all the Riesling and (compared to the then usual Mixed sentence ) careful separation of the plants. Particularly worth mentioning are the extensive improvements of the vineyards by making southern slopes from northern slopes with large earth movements, artificially raising southern slopes and draining many layers. He was followed by his son Ludwig Andreas (1811-1883), who continued the tradition and caused a sensation with his 1852er wines, which were selected in five varieties. His successor was his son-in-law Emil Bassermann-Jordan (1835-1915). His brother Otto was a friend and publisher of Wilhelm Busch (1832-1912), who wrote to this: "The Deidesheimer is a real refreshment - but - only 17 bottles. I think you can get me, Your Noblesse, unscathed, sometimes for a payment. Only soon - God willing - I come in autumn and look forward to it " . Then followed Ludwig (1869-1914) and Friedrich (1872-1959), who led the estate together. Dr. jur. 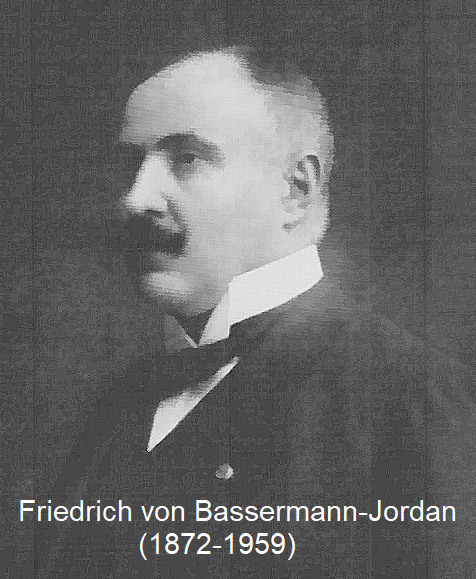 Friedrich von Bassermann-Jordan published in 1907 his still valid as a standard work book "The History of Viticulture" in three volumes. The second extended edition followed in 1923. As a result, he published countless other wine-historical works, became an internationally recognized authority as a viticulture historian, exercised decades of significant influence on the entire German viticulture and received numerous honors and titles, for example, President of the Bavarian and Vice President of the German Viticulture Association ( DWV ). Friedrich von Bassermann-Jordan also significantly influenced the first German wine law. On the occasion of his 85th birthday donated the DLG (German Agricultural Society) the "Friedrich v. Bassermann-Jordan Medal ", which may be awarded to a maximum of ten living personalities who have earned" outstanding services to the German wine industry ". His son Ludwig von Bassermann-Jordan (1924-1995) headed the winery from 1959 and promoted especially the viticulture specialist training. After his death, his widow Margrit von Bassermann-Jordan took the lead. In 2002, the winery was sold to the Neustadter entrepreneur Achim Niederberger. After his death in 2013, the company is managed by Jana Niederberger together with Ulrich Mell (technical director since 1997) and Gunther Hauck (commercial director since 1998). Today, the winery includes 50 hectares of vineyards in individual layers Grain Hübel. Herrgottsacker. high morning. limekiln. Kieselberg. Langenmorgen, Leinhöhle, Mäushöhle. paradise garden (Deidesheim) high Castle. Reiterpfad. pike (Ruppertsberg), as well Freundstück. Jesuitengarten. Kirchenstück. Pechstein, Pen, Enormous (Forst). They are planted with the white varieties Riesling (90%), Chardonnay, White Burgundy and Pinot Gris, and the red varieties Pinot Noir and Merlot. The cellar of the winery has a special position, because over the centuries a wine museum with innumerable, most valuable artefacts was created here. It includes, for example, Roman amphorae from the 1st to the 3rd century, tin bottles from the time of the Thirty Years' War, a 1706er wine, one of the legendary ones 1811er Forster monsters as well as completely all vintages since the 1880s. The wines of the private collection are not for sale.